In Jeffty Is Five, the narrator has a lifelong relationship with a childhood friend who never ages. The titular Jeffty, Jeff Kinzler, seems stuck in an alternate timeline, where Robert E. Howard keeps coming out with new stories (but only for Jeffty) and there’s always a new Captain Midnight every week on the radio, decades after radio’s golden era. It’s off — its all off, and Jeffty’s world is a fragile, if joyful, place for the narrator to visit. Jeffty may not know what he is missing in his arrested state, but the narrator is keenly aware of what his contemporaries are missing in the progressive state. I seem to have stepped a little bit into Jeffty’s world in my inquiry into the decline of science fiction since 1960. Now by adding the remaining decades to last week’s 1960s vs 2000s data, I feel as if have been able to pinpoint the origin of decline. *Average Amazon Star Rating of that decade’s “Classics” according to GoodReads. There is a very odd outlier in the 1990s: William Gibson’s The Difference Engine is listed as the #4 all-time classic for that decade, despite GoodReads reviews rating it extremely low for a classic. In fact, by GoodReads rating, The Difference Engine wouldn’t rate in the top 30 of its own list! On the other end of the spectrum, GoodReads doesn’t place A Night in the Lonesome October, by Roger Zelazny in the top 10 of its own list, but its GoodReads aggregate review score would place it #1. 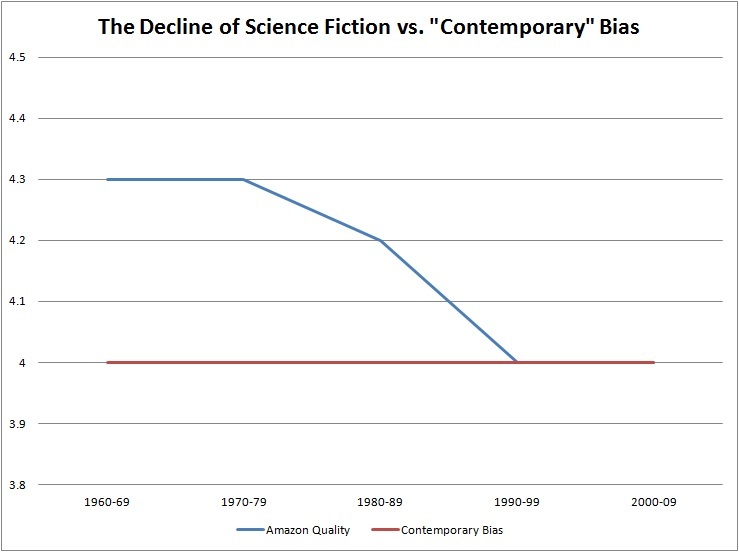 Nevertheless, these are details that have little impact on the big picture, and the big picture is this: if we accept GoodReads selection process for the best of each decade, Science Fiction has measurably declined in quality since the 1960s and 1970s. Sometime in the mid-90s, the gradual drop among each era’s best had hit an even four-star rating. But there’s something more unsettling than that. After all, once you have determined that there is a decline, people can work on restoration. No. What is really unsettling is what happens when we take a sober look at last week’s discovery of “Contemporary Bias.” In a nutshell, this is the idea that GoodReads users tend to more accurately self-report the quality of more recent fiction, and tend to downplay the quality of books in the past. The evidence already indicated that this was a phenomenon, but looking at the full data from 1960 forward and something really strange appears. Contemporary Bias is 100% static. The Blue Line is the Decline in SF According to Amazon. The red line is the contemporary belief that every era’s best have never been better or worse than exactly 4.0 stars. That red line is a pith, stunting the intellectual capacity of the modern mind to conceive of better days. It is a cap, applied by the careful means of a great and benevolent Tripod, a physical means of conforming society to a false but reliably unchanging standard. Science fiction novels degraded in the aggregate over time, but GoodReads has simply adopted a facade, and a disturbing one. I would have found it far less strange had the bias indicated a little dynamism in the red line – for example, that the 1970s were bias rated at 4.1 but the 1960s at 3.9. That at least would have shown some thought, some disformity, some…human response. But no. GoodReads demonstrates its own belief that every decade in comparison with the most recent one in decline, is and has been identical in quality. Jeffty, you see, isn’t really five. He’s 4.0. He has always been 4.0. I suspect the difference is due to the different reviewer populations. GoodReads skews pinkshirt. I will bet that if you compare the ratings of 10 pinkshirt writers, writers like Scalzi, Jemisin, Kowal, Walton, and Ahmed, they will score at least .5 higher on average than they do on Amazon. Conversely, if you take 10 Blue SF writers, you’ll likely find that they score at least .7 higher on Amazon than they do on GoodReads. Exactly. However, I can’t stress enough this enough: the Pink bias at GoodReads extends to its selection of Classics. In other words, GoodReads devalues their own 1960s Top Ten list – which includes Pink favorites Le Guin and Vonnegut – versus what Amazon thinks of them! I suspect that if GoodReads somehow had a list of 1960s Classics that excluded New Wave and literary fiction, this divergence would be far greater. So, the GR lists from the 1960s, 1970s and 1980s is a pinkshirt delusion at a number of levels: it insists on wedging in non-Classic SF in order to round out its list, and then, after politicizing and watering down the quality of that list, backwards-casts a perception of that list that says the 1960s are equal to, not better than, the best of the 00s. The short finding for me is this: Pink SF cadres observably and measurably denigrate their own selection of Classics in order to prop up the perception of full-blooded pinkshirt quality. It’s that unchanging 4.0 across all time that I suspect is just more than a bizarre coincidence. It is a weapon formed against the spirit of SF. I would have thought there would be a bias in favor of classics, against what is new, simply for the sake of “this is a known classic, therefore I will rank it of higher value”. Goes to show I’m wrong, and probably because many reviewers (at least on Goodreads) don’t like those racist, sexist, white, Christian heterosexual men writing books. As for The Difference Engine, I read it several years ago. I believe Bruce Sterling was the co-writer. It’s steampunk-ish, with a plot point that’s never explained (like the silver briefcase in Ronin — can’t remember what you call them). It was flat and not memorable, with postmodern characters in a Victorian setting. I expected the same – that Ursula Le Guin and Kurt Vonnegut at the very least – would have an inflated score by people who hadn’t necessarily read them but knew them to be palatable “Classics.” Take a look at the Contemporay Bias post (link above) to see a list of the books. Now, both Le Guin and Vonnegut fair much better than say books I actually consider to be classics (Such as Zelazny’s or Harry Harrison’s) in the memory of GoodReads users, but they still downplay them against Amazon buyers. What’s undoubtable is if they were forced to rate a Bluer list of Classics, they would deflate their overall quality even more than their own favorites. That’s the essence of the unspoken conspiracy to me: that they’ll denigrate their own old favorites just for the illusory sake of the image of the bland and unispired new.